In 10-inch nonstick skillet, heat 2 tablespoons of the oil over medium heat. Add onions; cook, stirring occasionally, 10 to 12 minutes or until deep golden brown. Add vinegar, 1/2 teaspoon of the salt and 1/4 teaspoon of the pepper; cook 1 minute longer or until liquid has evaporated. Remove from heat; set aside. In small bowl, mix cheese, mayonnaise and remaining 1/4 teaspoon pepper. Set aside. Heat gas or charcoal grill. Sprinkle steak with remaining 1/2 teaspoon of the salt and remaining 1/2 teaspoon of the pepper. Place steak on grill over medium-high heat. Cover grill; cook for 8- 10 minutes turning once for medium rare or until of desired doneness. Transfer steak to cutting board; let rest 10 minutes. Lightly brush cut sides of rolls with remaining 2 tablespoons of the oil. Place rolls, cut side down, on grill rack. Cook 1 to 2 minutes or until golden. Thinly slice steak across grain on the diagonal. 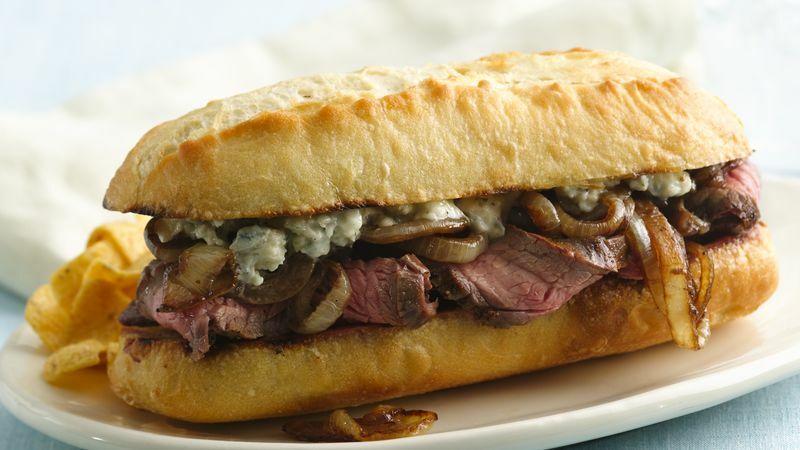 Divide steak among bottom halves of rolls; top each with one-fourth of the onions. Spread cut sides of baguette tops with cheese mixture; place on top of onions. Serve immediately. Don't be in a rush to caramelize the onions. Cooking them longer over medium heat brings out their natural sweetness and helps to avoid burning. To broil steak, place steak on broiler pan. Broil with top about 4 inches from heat 4 1/2 minutes per side for medium rare or until desired doneness. Transfer steak to cutting board; let rest 10 minutes. If you’re in the mood to splurge, try using New York strip steak in place of the flank steak. Don’t be in a rush to caramelize the onions. Cooking them longer over medium heat brings out their natural sweetness and helps to avoid burning.